Anderson’s Bicycle Rental has been family owned and operated 1978. We are the only bicycle rental situated at the beginning of the National Forest Bike Trail which is protected and safe from motor traffic. The Forest Trail takes bicyclists along South Lake Tahoe's most breathtaking scenery through paved paths through the national forest, down toward historical Camp Richardson and along the shores of the Lake. 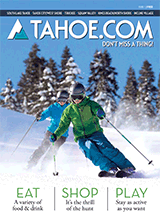 Come see why we are voted BEST OF TAHOE. Our Bike paths will lead you and your family through the jewels of Lake Tahoe. Our fleet of over 300 bikes, makes us a great choice for family reunions, large parties and corporate groups. We treat everyone as “family” and hope to make good memories for the years to come, full of the many memories and fun sites to see along our pristine paths in South Lake Tahoe.